On May 19, 1925 Louise Norton little gave birth to a boy named Malcolm Little. Malcolm had 8 other siblings that he grew up with. Malcolm had a father name Earl Little, Earl was a Baptist minister. Earl and his family received death threats from the white supremacist organization “Black Legion”. Malcolm and his family had to move twice before he turned four. In 1929, Malcolm lived in Michigan where his house was burnt down. Two years later his father was murdered. Years later his mother was put into a mental hospital and Malcolm was sent to a foster home. Malcolm and his friend “Shorty” decided to move back to Boston and were arrested in 1946 for burglary. He was in jail for 7 years then grant parole. While he was in jail he gained knowledge on the Nation of Islam. After his calling Malcolm was a minister and national spokesperson for the Nation of Islam. He also assisted in building new mosques in larger cities. On February 21, 1965 Malcolm X was delivering a speech at a ball room in Manhattan when three members of the Nation of Islam walked onto the stage and shot him a total of 15 times, Malcolm died at the age of 39. 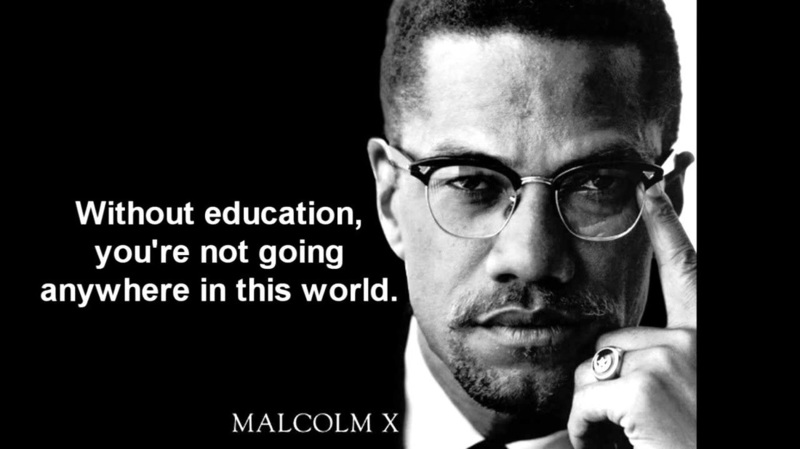 From a young age Malcolm was influenced by his father's extensive involvement as a Black civil rights activist. Between the constant death threats from the “Black Legion” and the death of his father, this ultimately shaped his views about freedom and supremacy. Later on in his life he was convicted for burglary and sentenced to 10 years in prison. While serving his time in prison Malcolm becoming increasingly interested in the Religious organization the Nation of Islam (NOI). The NOI often worked with African Americans to help empower them and gain independence from the Whites. Malcolm became an avid follower even going as far to change his surname to ‘X’ because he believed it was his lost tribal name. With his new identity he was appointed to be a minister and national spokesperson of the NOI. He also took charge of establishing new mosques in larger cities such as Detroit, Michigan and Harlem. Through numerous newspaper articles and televised speeches he was credited with attracting over 29,000 new members. The amount of popularity in both hate and admiration began to surround every aspect of Malcolm X’s life. He soon began to out shine Elijah Muhammad (his long time mentor) which made him very uncomfortable and slightly overwhelmed. Malcolm quickly began to draw the attention of the government and the FBI who would constantly try and infiltrate the NOI and secretly place bugs, cameras and wiretaps in his home. Soon after Malcolm discovered that Elijah Muhammad had been secretly having affairs with six different women which had resulted in the birth of several children. This was a clear violation of the teachings of NOI and this news had deeply upset Malcolm shaking his faith at the height of his civil rights movement. Unable to look past Muhammad’s lies and deception he decided to resign from the NOI and create his own Religious organization called the Muslim Mosque Inc. After the large controversy around Malcolm terminating his relationship had settled, the FBI caught wind of an upcoming assassination attempt on Malcolm’s life. After numerous attempts on his life Malcolm seldom left the protection of his bodyguards. Although on February 21, 1965 while speaking at the Manhattan’s Audubon Ballroom, the stage was rushed by three men carrying automatic weapons who shot Malcolm times at close range. He was pronounced dead at the scene. The issue Malcolm was trying to deal with was extreme racism. He was very passionate about his people being free. Although racism is still around today, Malcolm has done his part to better the world and make everybody see each other as equals. Below are just some of the things that Malcolm, and his people had to deal with. They were forced to drink at different water fountains then white people. They had to sit in different rooms in bars. Some were forced to live in "all black communities". Black people attended different schools that white people. Because of the contributions and sacrifices Malcolm X and other prophets made, racism is not as large as a problem as it was 70 years ago. This organization was founded by Malcolm X and John Henrik Clark on June 24, 1964 in Harlem, New York. They sought to unite all western hemisphere african people, regardless of their religion in order to reestablish their african heritage, economic independence, and promote African American self-determination. They were able to do this by using a simple a platform created by Malcolm X encompassing five fronts called "The Basic Unity Program." This program called for Restoration, Reorientation, Education, Economic Security, and Self-Defense. Unfortunately after the assassination of Malcolm X the fledgling movement died. Ella Collins (Malcolm’s half sister) took over the OAAU, but was unable to inspire its members the way Malcolm did. Nonetheless the OAAU became the inspiration for hundreds of "black power" groups that emerged during the next decade. Although the Organisation of Afro-America Unity was abandoned after his death, it sparked the creation of many other Black activist groups. The Institute of the Black World is one of many examples of this. To learn more about this institute click on the link below.